Python is a very friendly language that has caught on in much more than just web development or scientific processing - it's almost everywhere now. Its readable, clean syntax helps even non-technical people to understand what's going on in the code they're looking at and this helps a lot when you're just getting started with this kind of interaction with the digital world. Spyhce is supporting the first DjangoGirls event here in Cluj-Napoca, and we had a mentor meeting a few days ago where we discussed about how more people, especially ladies - for this event, could get interested in programming. That got me thinking that a lot of people only look at programming from a professional perspective, asking "how can I turn this skill into a job? ", when there's a lot of other very interesting question that remain mostly unasked, like "how can I solve a practical problem that I have using code? ", or "how can I integrate code in my regular activities / job?". That's why I decided to take this opportunity to finish this article that Julia, our marketing specialist, has been badgering me to write, as it seems to be a nice response to one of the latter questions above. About an year ago my parent's house in Alba Iulia was left empty, after more than 50 years of someobody staying there day-to-day. Because of this guarantee that somebody was always there, there was never a lock on the gate (something pretty uncommon in urban Romania), and also, more importantly for this article, our local scout group used some of the available storage space for all their equipment. So a lock had to be placed on the gate, and a system had to be devised where the scouts could have uncomplicated access to their storage spaces. Of course, this could have been solved by placing a classical lock on the door and distributing some keys around, but I'm technically trained and I found this a good opportunity to ask myself "how can I solve a practical problem that I have using code?". The idea seemed (and actually is) pretty simple - have some sort of electronic lock on the door, connect that to the Internet and give family and scouts access to a web system accessible via mobiles to unlock the gate. A bit of googling quicly led me to an electromagnetic lock from a local provider, who luckly also sold compatible power supplies and relays at decent rates (250RON / 60EUR for the whole setup). There's minimum electrical knowledge required when picking and choosing these components to make sure that they're electrically compatible, but that's about all you need and you're set. For the electronics I had to choose between the ubiquous Arduino and RaspberryPI (just because I had one of both laying around) and of course I went for the RaspberryPI, as I wanted to play around with Python for this project. An added bonus for RaspberryPI is that it has integrated network support and I didn't have to order an additional component. I messed up when picking out the relay (don't ask) so, in true maker spirit, I had to improvise with a cheap transistor to get approprate electrical levels for the relay to open the gate. For the next piece of the puzzle, this Python script needs to be called somehow from the Internet by whoever needs to open the gate. Luckly, the scout group in Alba Iulia also has an app they use to manage everything (coincidentally also written in Python, and also written by me), so the public-facing interface would be in that Django app. This left two problems to be solved: how to address the RaspberryPi from the Django app server and how to actually call the script once we're there. 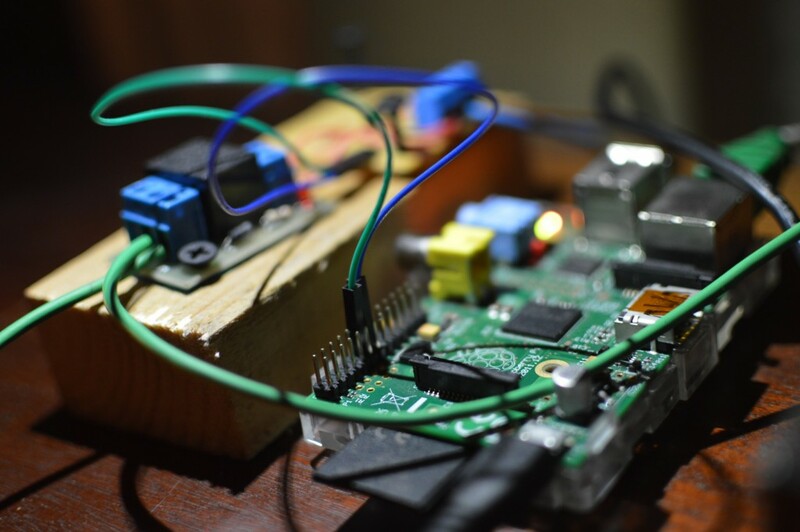 For the former, a few things needed to be considered: the RaspberryPi is conected on a private network that goes to the Internet via a router with a dynamic IP address, in a neighborhood where short power outages are pretty common. This required a robust, self-recovering solution that wasn't hindered by NAT and routers, and I finally went with a VPN connection from the RaspberryPi to the server. 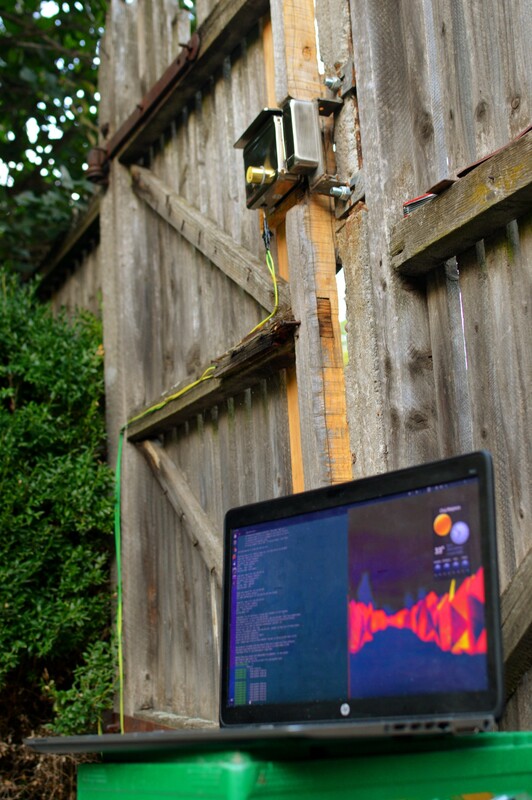 This provided me with a stable private IP address to the RaspberryPi, and also a way to reconnect after the power went out, and setting up an OpenVPN on a VPS is an one-hour deal.